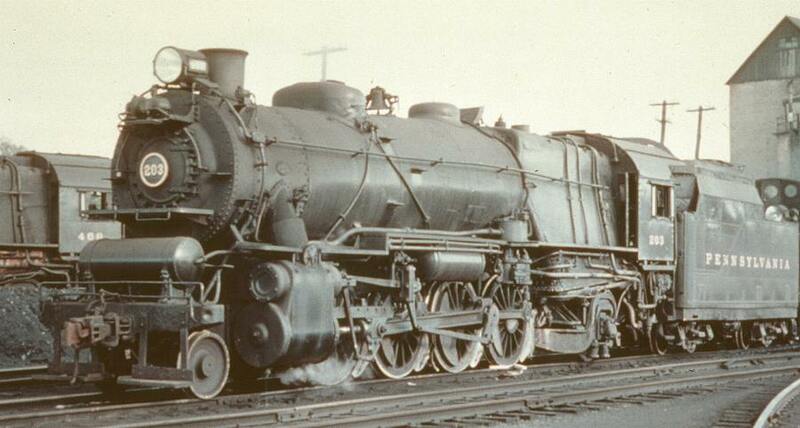 The Pennsylvania Railroad owned a total of 574 of these locomotives. They were PRR class L1. All were built between 1914 and 1919 by the Baldwin Locomotive Works, Lima Locomotive Works, and the PRR's Juniata/Altoona workshop. There are photos available in the "Pennsylvania Railroad" book (1997, MBI Publishing Company, ISBN 0-7603-0379-7, pg 22), and "The American Railroad" (1999, MBI Publishing Company, ISBN 0-7603-0512-9, pg 42). The Kato model was the first high-quality N-scale steam locomotive when it was released in 1996. It features a beautiful mechanism, solid performance, and quiet motor and gears. On the downside, it doesn't pull much weight (installation of the traction tire kit helps), and it seems to bind on curves with a radius of 13 inches or less. Externally it doesn't quite resemble the PRR L1 class locomotives. An upgrade kit from GHQ will fix that (the kit is, unfortunately, out of production - and I never got one). This is the stock model. It comes with a package of parts that the modeler can add. I never did that for this model. First step is to disconnect the tender from the locomotive. It pops loose from the engine, or, the other way to do this, unscrew the lead truck of the tender, and the drawbar assembly comes loose. The cab can be removed by gently prying the sides of the cab out a bit and moving it up. It will pop off. Grab the back or the front of the boiler and lift it up (lifting from the front shown in the photo below). Pry away the side "flares"/walkboards which are held in place with two pins. The weight can be removed and the light board can be slid out of its spot. There are screws that hold the two frame halves together. I have not had to go that far with this engine, so that is not shown. The main body of the tender slides off the frame just by pulling it up. You may need to pry the side out ever so slightly. The black plastic piece (second from the top in the next photo) snaps in place, so you will need to ever so slightly move the frame sides out a bit and insert a small screwdriver to lift it from the bottom. After that, all the remaining parts fall out. The contact strips touch the brass pickups in the trucks to provide extra rail pick-up points. I recommend you do a search for DCC conversion articles on the Web, to thoroughly familiarize yourself with all the possible conversion methods and approaches. My process is just the one I tried. The next photo shows the parts diagram that comes with the locomotive. It doesn't give any information about how to take this delicate locomotive apart. See my other article on how to disassemble this model. Using a knife I cut the circuit board paths to the LED. Next, I soldered the white and blue spare wires to the right and left side, respectively, of the circuit board in front of the cuts I just made. This allows the LED to be controlled by the decoder. Back to the locomotive. Here I have carefully removed the motor after marking its top with an arrow pointing to the front of the locomotive. This arrow not only indicates the correct direction, but also which side of the motor is up. I removed the brushes. They have a cap, and under the cap is a trigger-happy spring, so be extremely careful. It will fly away on you. I placed the contents of the brushes in the locomotive's case top so as to protect them from magically disappearing. Next, I soldered the leads to the brush caps. And then re-installed the brushes in the motor. Motor has been reinserted into the frame. Getting the gears to line up and connect again was a bit of a struggle. Patience is important. Next, I re-inserted the lightboard. I removed 1/4" of material from the tender floor's corners so that the wires can clear the floor. I soldered the decoder's leads to the contact strips. This was one of the most frustrating and time-consuming steps of the installation. The contact strips have to be placed just right, however the wires of the decoder are significantly stronger than the weight of the contact strips, hence the slightest movement of the decoder and one of the contact strips pops out its spot while maneuvering the other. Continuing with deep breaths and not letting frustration get the better of me, I was finally able to get it into place. I carefully positioned the tender floor, which holds the contact strips in place. This photograph shows the left side of the locomotive. It gives you an idea of how to route the wires. This is different from the way the web site, from which I got the textual document, describes how to do it, but I wasn't able to get the locomotive shell back on the frame based on the way they described it. The wires are routed underneath the engineer's seat. Here's a shot of the left side of the locomotive. If you have read this page before, you will remember that I wasn't happy with all those wires hanging out of the locomotive. Also the forward light didn't work anymore. Finally, when I placed the tender shell back on, the four wires were so tight that the locomotive actually derailed on anything but a 26" radius curve! This was unsatisfactory. I removed the white and blue wires from the decoder and the light board. This left the dark gray and orange wires that provide the motor contacts. The next photo is a shot of the locomotive put back together. It now performs flawlessly. At some point in the future we will come back and paint the orange wire black. I used the Micro-Trains # 2002 coupler conversion kit to change the coupler on the tender of this locomotive. The kit comes with two couplers, one for the front/pilot replacement and one for the tender replacement. I actually like the Kato coupler (a dummy) on the pilot better than the big bulky Micro-Trains coupler. So, I decided to leave the pilot as is. The following photo shows the various parts. The instructions tell you to remove the rear truck from the tender. That is done by removing a small screw (upper left-hand corner of photo). In the center of the photo is the capsule of springs. To the right of the capsule is the pilot coupler replacement, and the remaining parts are used to install the rear tender coupler. After studying the parts I realized that the tender coupler would be a simple replacement. I wanted to convert all of my locomotives and rolling stock to have body-mounted couplers. So, in the next photo you'll see the idea I came up with. Since I wasn't going to use the pilot coupler, I decided to body-mount it to the tender, and not use the tender coupler (as the instructions say). The next step was to temporarily tape the coupler to the tender, put the rear truck back on the tender, but backwards, and test the coupler height against one of the Micro-Trains box cars. It appeared to be a perfect match. The shape of the coupler body and the rear end of the tender were also a perfect match. This gave me some confidence to go ahead with the project. The coupler was taped to the under side of the tender. And here is the final result. I used Walthers' Goo glue to bond the coupler to the tender bottom. I am letting it dry overnight before testing the coupler. The last thing I did was to use the Dremel tool to cut away the coupler holder on the rear tender truck. This is so that it clears the new body-mounted coupler. But as you can see from this shot, it looks like it is going to work just fine. When I switched to using Micro-Trains Z-scale couplers as my fleet standard, I set about changing out this model's couplers, both tender and pilot. As shown above, I had previously installed an N-scale coupler with Walthers Goo, which made it easy to remove. The first thing to do is to check the tender frame's rail height against the Micro-Trains gauge to make sure that the coupler will wind up sitting at the right height. It was a perfect match. There appeared to be a slight lip at the end of the underbody, so I filed it down to provide a smooth, flat surface against which to mount the coupler. Using a small drill bit and a tap, I made a hole at the right location for the coupler. I installed the coupler with the supplied screw. It does show a bit on the top, but a bit of black paint will hide that. I also wanted to install a working coupler on the front of this locomotive. After careful studying, it turned out to be very easy to do with the Micro-Trains Z-scale coupler. The first photo shows the original parts, the dummy Kato coupler. The line drawn on the photograph points to the part that needs to be popped off the pilot deck. Once that's done, the dummy coupler can be removed. The next photo shows the bottom view of the pilot deck with the coupler installed. I had to glue a thin piece of styrene (transparent) to provide an even surface for mounting the coupler. I carefully drilled a hole just behind the cow catcher.